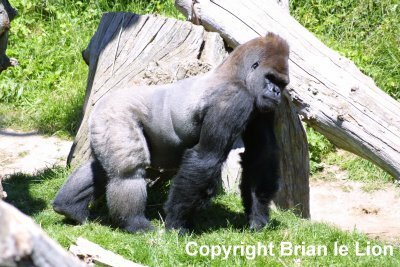 Ya Kwanza was Jersey Zoo’s male silverback gorilla weighing in at 235kgs, sucsessor to our much loved Jambo. He was born on the 3rd June 1984. He was the first gorilla ever born in Melbourne Australia and the first gorilla to be born by artificial insemination. Hence the name "Ya Kwanza" which means "the first" in Swahili. Unfortunately n his 18 years in Jersey, Ya Kwanza has turned his back on all but one female introducing only one surviving offspring.